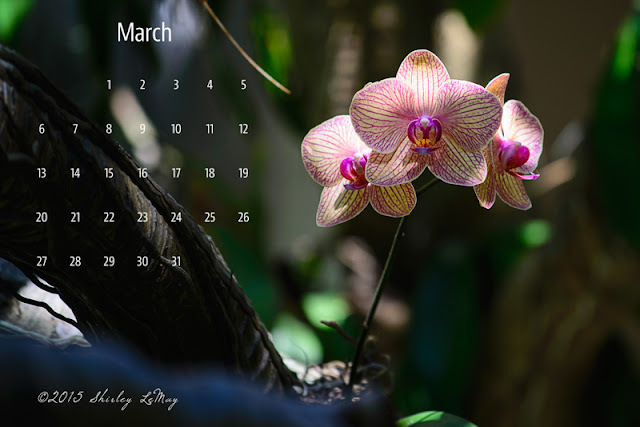 Continuing with the flower theme, here is a Phalaenopsis Orchid for March's calendar. In warm climates, this orchid can grow wild, rooting into a hospitable nook or cranny that provides moisture - in this case, off a tree branch. Folks may think these exotics are hard to care for, but I've successfully grown these orchids at home - as long as you water them once a week or so (I've gone longer than 2 weeks! 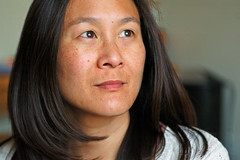 ), they will thrive in filtered sun. The bloom last for several weeks and are quite beautiful. This is so pretty, Shirley, and isn't it wonderful to have the orchids blooming now? What kind orchid of this pretty flower, shirley?